Possibly the biggest festival of the Witches’ year, Samhain is a time to remember those who have passed on, celebrate the Summers end, and prepare for Winter months ahead. The Sun God and earth fall into slumber, as the nights lengthen, and winter begins. The last day of October marked the end of the Celtic Old Year and the beginning of the New. This time was considered by the Celts and many Craft traditions to be a “crack between the worlds.” As time passed between one year and another, it belonged to neither, standing beyond the confines of normal reality. It was believed to be the one night when the veil that separated our world from the next was at its thinnest, allowing the dead to return to the world of the living, where their spirit and memory would be welcomed and celebrated by a feast attended by their kin. The Feast of The Dead, or Festival of The Dead, was a festival of remembrance, honoring those who had left this world. On this night, the deceased were believed to make their way back from the grave to revisit their old homes. In many areas, on the eve of Samhain, people would leave their houses lit throughout the night to help the dead find their way along the dark path from the tomb. And once these travelers arrived, they were welcomed and refreshed with food and drink. Many prepared a feast, and set a plate at the table to for their dead relatives. On the eve of November 1, or on the morning of the following day, the custom in parts of Europe was to bake “soul cakes” or “soul bread” for those returning souls. In Wales, special food was prepared and left outside, and before everyone went to bed, the hearth was carefully prepared for the arrival of the dead relatives. Tradition also teaches that the aid of spirits and guides from the other world was easily enlisted at this time, so in the increasing moonlight of longer nights, many used this time to hone their psychic and divinatory skills, especially with regard to love and marriage. 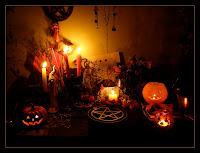 The alternative date of November 6th (‘Martinmas’ or ‘Old Hallows’) is sometimes employed by Covens. A guide for the solitary practitioner by Scott Cunningham. Everyday Wicca by Gerina Dunwich. To Ride A Silver Broomstick by Silver Ravenwolf. herbs have been hung to dry. *Copyright © 1997-99 Akasha, Herne and The Celtic Connection wicca.com. All rights reserved.